These videos detail Core JKD techniques and methods to make techniques work. If you are interested in gaining an understanding of a particular range, tool, or method for defense against single and multiple opponents, with and without weapons, these are the videos for you. More will be added, please bear with us, we have been experiencing a rather large growth period and are revamping our product lines. We are working hard to complete more videos with high quality information and will post them here as soon as we get them out. This Conditioning video is filled with almost 120 minutes of conditioning exercises that we use to keep in fight shape! Contains over 50 detailed conditioning exercises for MMA, any martial artist or person wanting to increase their power, speed and endurance while building FUNCTIONAL skills for fighting. Are you tired of not knowing how to strike effectively? Is your foundation wrong? Are you setting up your kicks and punches properly? 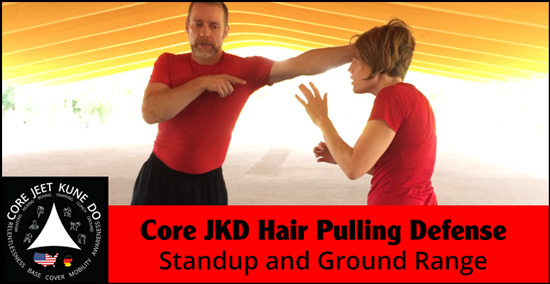 The Core JKD Striking Tools videos will help you. Each video details the striking tool techniques for their range. You will know precisely how to throw the punch or set up for the kicks and deliver them with speed and power. 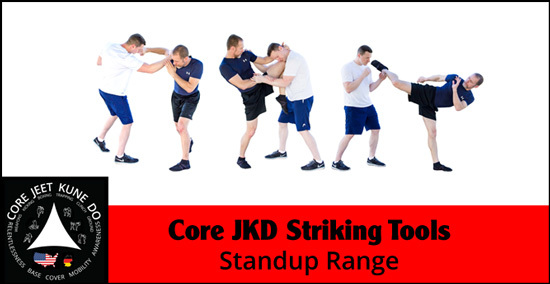 There are 34 videos in this group giving you 2 1/2 hours of video on the striking tools we use in our Core JKD kicking and boxing range. As usual, we teach tools used for functional fighting in the street, the Core JKD way. We demonstrate how we set up the striking tools for the best effect in a fight. Click on the image above to get the full listing of tools trained. Have you ever had your hair used against you in a fight? Have you seen the online video showing fights that end terribly because someone was able to gain control of their opponent's hair and smash their head on the ground? This video set shows you exactly how to defend yourself when someone grabs your hair in a fight - Standup or on the Ground! You will learn how to control and defeat an attacker who grabs your hair standing or when they are on top of you and you are helplessly on your back. This is a two video set. As with every Core JKD video, I don't waste your time talking for 30 minutes before I show you anything. I value your time—I value mine. We get right to the action and the details that will make you effective in a fight by SHOWING it to you.